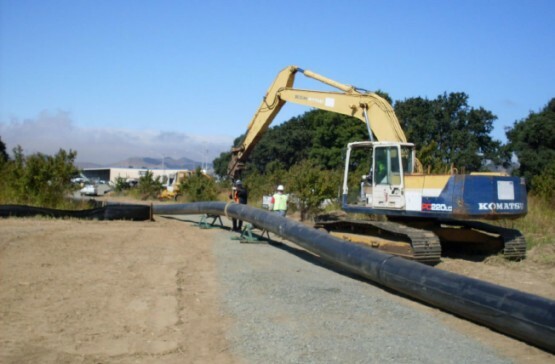 As the trenchless subconsultant to HDR Inc, Bennett Trenchless provided design assistance for the relocation of Solano Irrigation District’s water main crossing of Suisun Creek. The crossing needed to be relocated due to Caltrans’ relocation of the nearby Cordelia Truck Scales on Interstate-80. The 20-inch pipeline was relocated using horizontal directional drilling; the crossing was approximately 350 feet long. Design included selection of the bore profile and alignment, evaluation of hydrofracture and settlement risks, pullback loads and pipe stress calculations, preparation of a Hydrofracture and Surface Spill Contingency Plan, and development of a cost estimate and schedule. Bennett Trenchless also provided submittal review and full-time on-site inspection of the HDD operations. Challenges on the project included crossing beneath endangered species habitat, high groundwater, high hydrofracture risk, work area restrictions, and protection of nearby utilities. The alignment of the crossing was constrained by the ability to acquire temporary and permanent easement from various private owners on both sides of the crossing.